36One of the Pharisees asked Jesus to have dinner with him, so Jesus went to his home and sat down to eat. 37When a certain immoral woman from that city heard he was eating there, she brought a beautiful alabaster jar filled with expensive perfume. 38Then she knelt behind him at his feet, weeping. Her tears fell on his feet, and she wiped them off with her hair. Then she kept kissing his feet and putting perfume on them. 40Then Jesus answered his thoughts. “Simon,” he said to the Pharisee, “I have something to say to you.” “Go ahead, Teacher,” Simon replied. 41Then Jesus told him this story: “A man loaned money to two people—500 pieces of silver to one and 50 pieces to the other. 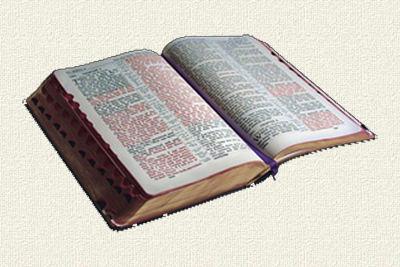 43Simon answered, “I suppose the one for whom he canceled the larger debt.”“That’s right,” Jesus said. 44Then he turned to the woman and said to Simon, “Look at this woman kneeling here. When I entered your home, you didn’t offer me water to wash the dust from my feet, but she has washed them with her tears and wiped them with her hair. 45You didn’t greet me with a kiss, but from the time I first came in, she has not stopped kissing my feet. 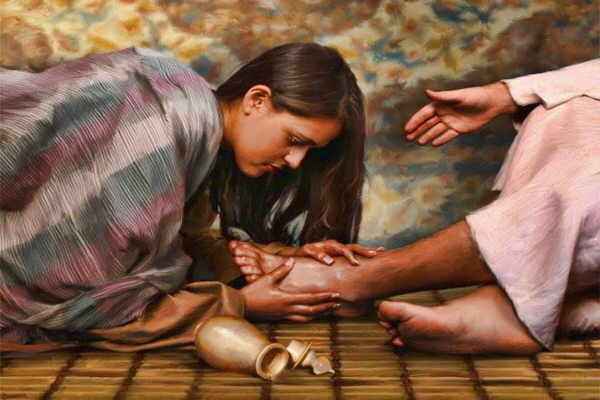 46You neglected the courtesy of olive oil to anoint my head, but she has anointed my feet with rare perfume.